The governor of Afghanistan’s volatile Helmand Province said Iranians and Pakistanis have recently met with Taliban insurgents involved in fighting Afghan forces. 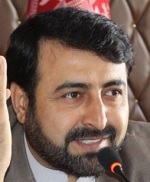 Governor Hayatullah Hayat told Radio Free Afghanistan on January 22 that “Iranian interference [in Afghan affairs] has increased” recently, noting the meeting with Taliban fighters in Helmand’s Garmsir district that he said also involved Pakistanis. He added that the Pakistani military is also involved in “mobilizing insurgents” in Helmand.